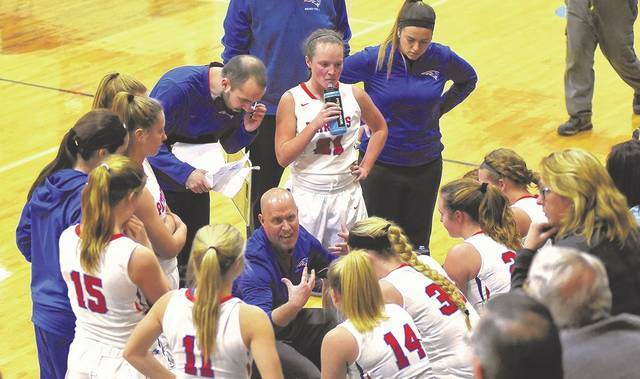 Tri-Village girls basketball coach Brad Gray talks to his team during a time out in a recent game. The Lady Patriots earned the No. 1 seed in the Division IV Brookville sectional tournament at Sunday’s tournament draw meeting. TROY – It’s no surprise that Tri-Village earned the top seed in the Division IV Brookville sectional tournament. At 18-1 and ranked fourth in the state, the Lady Patriots, who were regional semifinalists a year ago, earned 13 first-place votes and 154 points to garner the No. 1 seed at Sunday’s draw meeting. Coach Brad Gray took a first round bye with his selection and will await the winner between 9th-seeded Miami Valley and 7th-seeded Newton for a 6 p.m. tip off on Tuesday, Feb. 19 at Brookville. “We still have to focus on three remaining regular season games making sure we don’t lose focus and start looking too far ahead,” Gray said. “We are obviously happy with the No. 1 seed, but a seed doesn’t really get anything done for you. We still have to go out and play and make sure we are taking care of business when the time comes. Covington got the other first-place vote and totaled 132 points to earn the No. 2 seed. They were followed by Franklin-Monroe (122 points) at No. 3, Troy Christian (109 points) at No. 4 and Springfield Catholic Central (100 points) at No. 5. The remaining seeds in the 14-team sectional are as follows: No. 6 Bradford (98 points), No. 7 Newton (74 points), No. 8 Yellow Springs (72 points), No. 9 Miami Valley (67 points), No. 10 Twin Valley South (52 points), No. 11 Dayton Christian (44 points), No. 12 East Dayton Christian (28 points), No. 13 Tri-County North (26 points) and No. 14. Dayton Jefferson (12 points). Franklin-Monroe (14-5) will kick off its tournament with a 2 p.m. matchup against Dayton Christian (7-11) on Saturday, Feb. 16. Bradford (14-6) will face Yellow Springs (10-8) at 8:30 p.m. on Wednesday, Feb. 13. “Being the No. 6 seed is right about where we figured we’d be so no surprises there,” Bradford coach Chris Besecker said. “Now we just learn something about our opponent and see where we stack up against them. Darke County’s other two Division IV teams – Ansonia and Mississinawa Valley – will compete in the Sidney sectional. The Lady Tigers (2-17) are the 12th seed and will face the winner between 11th-seeded Jackson Center and 4th-seeded Mechanicsburg at 11 a.m. on Saturday, Feb. 23. Mississinawa Valley is the 13th seed and will face the state’s No. 1-ranked team Fort Loramie (19-1) in the opening round at 6:30 p.m. on Tuesday, Feb. 19. In Division II, Greenville earned 83 points to capture the fifth seed in the 13-team bracket. State-ranked Dayton Carroll is the top seed with 12 first-place votes and 140 points. Trotwood-Madison is the No. 2 seed with 119 points followed by Kenton Ridge with 1 first-place vote and 110 points at No. 3 and Tippecanoe with 105 points at No. 4. The Lady Wave (8-10) will take on Bellefontaine (9-11) at 3:30 p.m. on Saturday, Feb. 16 at Tecumseh. Versailles earned the No. 4 seed and Arcanum the No. 7 seed in the Division III Covington sectional. Waynesville (18-0) received 14 first-place votes and totaled 330 points to grab the No. 1 seed. West Liberty-Salem is No. 2 with 3 first-place votes and 308 points followed by Anna at No. 3 with 286 points just ahead of fourth-seeded Versailles with 3 first-place votes and 285 points. Miami East (255 points) is the fifth seed followed by Jamestown Greeneview (247 points) at No. 6 and Arcanum at No. 7 with 224 points. The Lady Trojans (14-6) will open the tournament against Jamestown Greeneview in a 6 p.m. battle on Wednesday, Feb. 13, while the Lady Tigers (14-5) will face 16th-seeded Urbana at 6 p.m.. on Thursday, Feb. 14. “I am happy with a 7th seed,” Arcanum coach Michael Dean said. “I think it shows respect even though we are a young team with a new coach and new system by some of the powerhouses in the district, and those teams are loaded with seniors and ready to make a run.